Greetings, forex friends! The Fed voted to hike the Fed Funds Rate yesterday. If you somehow missed it and want a quick rundown on the key points, then here are the 6 key highlights from the June FOMC statement that you need to know about. The Fed decided to raise the target range for the Fed Funds Rate by 25 basis points from a range of 0.75% – 1.00% to a new target range of 1.00% – 1.25%. This was widely expected. 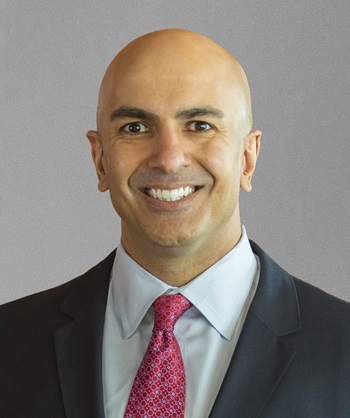 What wasn’t as widely expected, however, was that Minneapolis Fed President Neel Kashkari would dissent (again). 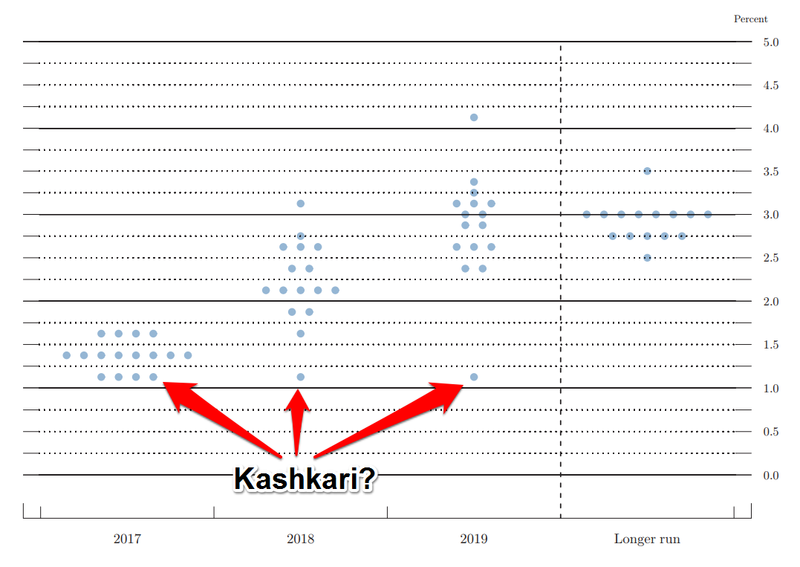 We won’t know why Kashkari opted to vote for keeping rates steady until the meeting minutes are released, but Kashkari’s March 17 blog post does provide some clues. And to sum it up, Kashkari believes that there’s still slack in the labor market. In addition, Kashkari is not very confident that enough inflationary pressure is building up to warrant a rate hike because wage growth hasn’t really picked up the pace. As you can see above, the Fed slightly nudged its GDP growth forecast for 2017 from 2.1% to 2.2%. GDP growth projections for 2018 and 2019 were unchanged, however. During the presser, Fed Head Yellen explained that the slight upgrade to 2017 GDP growth was due to signs of continuing expansion in business investment and expectations of higher household spending. Moving on, the Fed also had better forecasts for the jobless rate, with the jobless rate now expected to fall to around 4.3% by December 2017, down from the March forecast of 4.5%. The jobless rate is then expected to slide lower to 4.2% by the end of 2018 and hold steady there until 2019. These are better projections compared to the 4.5% in 2018 and 2019 that was forecasted in the March statement. GDP growth may have been nudged higher and forecasts for the jobless rate improved. However, the same can’t be said for the Fed’s projections for inflation, at least for 2017. With regard to the Fed’s projected path for the Fed Funds Rate, the Fed still expects the Fed Funds Rate at 1.4% by the end of the year. And using 1.25%, which is the upper bound of the new target range, then that means the Fed is still open to one more 25 bps hike by the end of the year. The Fed’s dot plot also shows that four Fed officials expect the Fed Funds Rate to be at 1.625%, eight forecast the Fed Funds Rate at 1.375%, and four project the Fed Funds Rate at 1.125%. This means that four Fed officials are open to at least one more rate hike, eight Fed officials are open to just one more hike, and four would be unwilling to support further hikes. And I’m pretty sure Kashkari is one of the four Fed officials who won’t support further hikes. Unfortunately, the dot plot includes all FOMC members, voting and non-voting alike. Still, the four who won’t support further hikes would still be in the minority, even if they are all voting FOMC members. Also worth noting is that the projected path for the Fed Funds Rate in 2019 was downgraded from 3.0% to 2.9%. This still projects seven more rate hikes, though. As such, the path for Fed Funds Rate is “still essentially unchanged,” as Yellen puts it. One journalist challenged Yellen during the Q&A portion to justify the “rush” to hike rates, given that the Fed decided to hike even as its inflation forecast for 2017 was downgraded. In short, the Fed’s decision to hike is preemptive, according to Fed Head Yellen. If you can still remember, I highlighted in my write-up for the May FOMC minutes that the FOMC staff proposed a “possible operational approach” for reducing the Fed’s balance sheet. And as a quick refresher, the proposal was basically to allow a set amount of the Fed’s bond holdings to mature. And only the principal payments beyond this set amount would be reinvested. After that, the set amount would be increased every three months until it reaches a predetermined level. And in the Fed’s official press statement, the Fed said that the Fed expects to start trimming its balance sheet “this year” (with the usual caveats of course). The Greenback tumbled ahead of the FOMC statement, thanks to the poor monthly CPI and retail sales readings. However, the Greenback quickly recouped its losses once the Fed released its official press statement since it revealed that the Fed pushed through with another rate hike, despite the recent disappointing data. And this was apparently seen as a sign of confidence. Moreover, the Fed maintained its projections for the Fed Funds Rate while Yellen’s tone during the presser was cautiously hawkish overall. Heck, she even downplayed the downgraded inflation projections by saying that it’s a one-off. And those factors likely enticed even more Greenback bulls to jump in.